Born 1854, Warickshire, England. Died 1914, Eltham, Victoria. 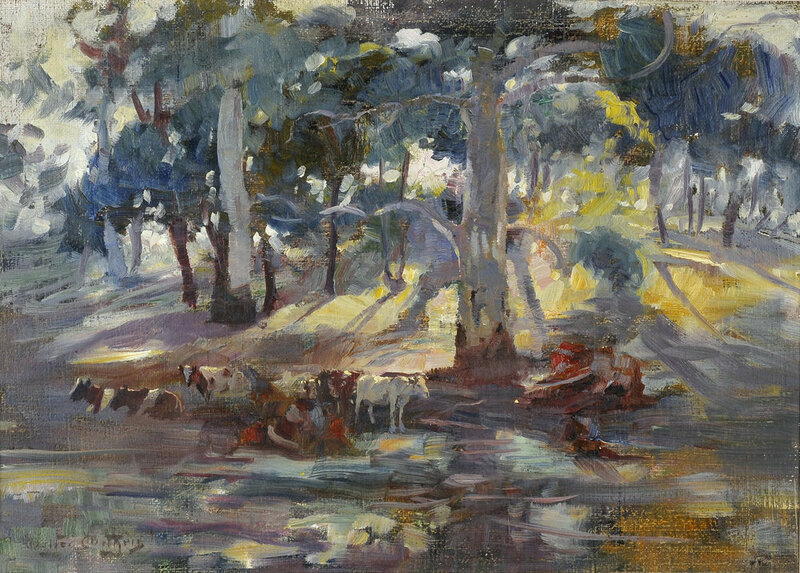 Walter Herbert Withers was a landscape artist, teacher and member of the Heidelberg School of Australian Impressionists. Withers studied at the Royal College of Art, London, before arriving in Australia in 1883. Working for eighteen months as a jackaroo he developed a love for the countryside, which is reflected in many of his paintings. After a short time back in Europe he returned to settle in Melbourne where he became associated with Tom Roberts, Frederick McCubbin and Louis Abrahams, and later Arthur Streeton and Charles Conder. With the collapse of the land boom in the 1890s and subsequent depression commissions became scarce and Withers worked as a commercial art and teacher to provide a regular income. He had a marked influence on younger students of the day, including brothers Percy and Norman Lindsay, and was an important figure in the Melbourne arts scene until his death. He won many awards, including the first Wynne Prize for landscape awarded in Sydney in 1895. In Cattle Resting, Withers’s loose brushstrokes capture the light breaking through trees in this tranquil scene, transforming the landscape into a myriad of colour.